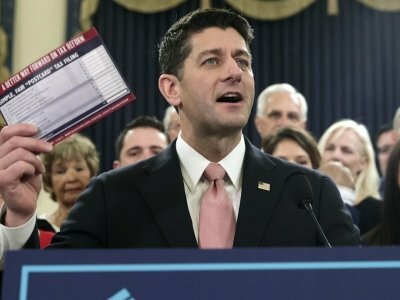 WASHINGTON (AP) — With fanfare and a White House kickoff, House Republicans unfurled a broad tax-overhaul plan Thursday that would touch virtually all Americans and the economy’s every corner, mingling sharply lower rates for corporations and reduced personal taxes for many with fewer deductions for home-buyers and families with steep medical bills. The measure, which would be the most extensive rewrite of the nation’s tax code in three decades, is the product of a party that faces increasing pressure to produce a marquee legislative victory of some sort before next year’s elections. GOP leaders touted the plan as a sparkplug for the economy and a boon to the middle class and christened it the Tax Cuts and Jobs Act. It would also increase the national debt, a problem for some Republicans. And Democrats attacked the proposal as the GOP’s latest bonanza for the rich, with a phase-out of the inheritance tax and repeal of the alternative minimum tax on the highest earners — certain to help Trump and members of his family and Cabinet, among others. “If you’re the wealthiest 1 percent, Republicans will give you the sun, the moon and the stars, all of that at the expense of the great middle class,” said House Minority Leader Nancy Pelosi, D-Calif.
And there was enough discontent among Republicans and business groups to leave the legislation’s fate uncertain in a journey through Congress that leaders hope will deposit a landmark bill on Trump’s desk by year’s end. Underscoring problems ahead, some Republicans from high-tax Northeastern states expressed opposition to the measure’s elimination of the deduction for state and local income taxes. Senate Finance Committee Chairman Orrin Hatch of Utah called the House measure “a great starting point” but said it would be “somewhat miraculous” if its corporate tax rate reduction to 20 percent — a major Trump goal — survived. His panel plans to produce its own tax package in the coming days. The House Republicans’ plan, which took them months to craft in countless closed-door meetings, represents the first step in their effort to reverse what’s been a politically disastrous year in Congress. Their drive to obliterate President Barack Obama’s health care law crashed, and GOP lawmakers concede that if the tax measure collapses, their congressional majorities are at risk in next November’s elections. The package’s tax reductions would outweigh its loophole closers by a massive $1.5 trillion over the coming decade. Many Republicans were willing to add that to the nation’s soaring debt as a price for claiming a resounding tax victory. But it was likely to pose a problem for others — one of several brushfires leaders will need to extinguish to get the measure through Congress. Republicans must keep their plan’s shortfall from spilling over that $1.5 trillion line or the measure will lose its protection against Democratic Senate filibusters, bill-killing delays that take 60 votes to overcome. There are just 52 GOP senators and unanimous Democratic opposition is likely. The bill would telescope today’s seven personal income tax brackets into just four: 12 percent, 25 percent, 35 percent and 39.6 percent. — The 25 percent rate would start at $45,000 for individuals and $90,000 for married couples. — The 35 percent rate would apply to family income exceeding $260,000 and individual income over $200,000, which means many upper-income families whose top rate is currently 33 percent would face higher taxes. — The top rate threshold, now $418,400 for individuals and $470,700 for couples, would rise to $500,000 and $1 million. The standard deduction — used by people who don’t itemize, around two-thirds of taxpayers — would nearly double to $12,000 for individuals and $24,000 for couples. That’s expected to encourage even more people to use the standard deduction with a simplified tax form Republicans say will be postcard-sized. Many middle-income families would pay less, thanks to the bigger standard deduction and an increased child tax credit. Republicans said their plan would save $1,182 in taxes for a family of four earning $59,000, but features like phase-outs of some benefits suggest their taxes could grow in the future. “The plan clearly chooses corporate CEOs and hedge fund managers over teachers and police officers,” said Rep. Bill Pascrell, D-N.J.
One trade-off for the plan’s reductions was its elimination of breaks that millions have long treasured. Gone would be deductions for people’s medical expenses — especially important for families facing nursing home bills or lacking insurance — and their ability to write off state and local income taxes. The mortgage interest deduction would be limited to the first $500,000 of the loan, down from the current $1 million ceiling. Led by Rep. Kevin Brady, R-Texas, chairman of the House Ways and Means Committee, the authors retained the deductibility of up to $10,000 in local property taxes in a bid to line up votes from Republicans from the Northeast. The panel planned to begin votes on the proposal next Monday. “It’s progress, but I want more,” said Rep. Leonard Lance, R-N.J., who represents one of his state’s wealthier, higher-cost districts and wants the entire property tax deduction restored. On the business side, the House would drop the top rate for corporations from 35 percent to 20 percent. American companies operating abroad would pay a 10 percent tax on their overseas subsidiaries’ profits. Cash that those firms have amassed abroad but now return home would face a one-time 12 percent tax. Also reduced to 25 percent would be the rate for many “pass-through” businesses, whose profits are taxed at the owners’ individual rate. The U.S. Chamber of Commerce praised the measure but said “a lot of work remains to be done.” The group’s chief policy officer, Neil Bradley, said pass-throughs were one concern. AP reporters Andrew Taylor, Zeke Miller and Kevin Freking in Washington and Mike Catalini in Trenton, New Jersey, contributed. This story has been corrected to say 52 GOP senators, not 50.